“Point” blankets are wool blankets marked on one edge with black or indigo stripes. They were a very important item in the fur trade. The Native peoples valued them for several reasons – they were warm, durable, light-weight and very useful as clothing. The bright colors were popular, but the white blankets also sold well in the winter when they were useful for camouflage in the hunt. For over a century, point blankets were an essential item imported to Rupert’s Land in the fur trade. 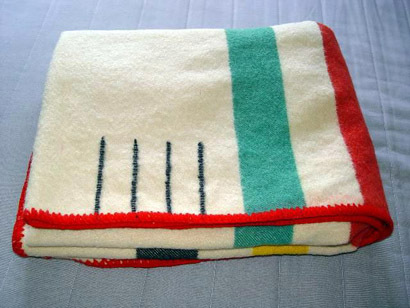 They continue to be sold today, though they are now inextricably associated with the Hudson’s Bay Company, and are even sold by other companies as “HBC blankets.” But the first so-called “pointed” blankets were made for French trading companies for sale to Aboriginal buyers. There are references to “point” blankets in early French trade records dating back at least to the very early 1700s. The Hudson’s Bay Company did sell “blanketing” or “duffle,” a heavy wool cloth, but not point blankets before 1780. In 1779, Thomas Huchins at Albany House was approached by a Canadien fur trader, Monsieur Germain Maugenest, who offered to help the Hudson’s Bay Company improve its trade. Maugenest was sent to London on the next supply ship. Arriving in London he was quickly hired by the Hudson’s Bay Company as an advisor and trader. Maugenest made several suggestions for new trade items, including lidded copper kettles, which became a staple trade good, and he also suggested that the HBC start trading blankets similar to those produced for Montreal-based companies. The company took up Maugenest’s suggestion and approached a woolen manufacturer, Thomas Empson of Whitney in Oxfordshire, to make up a trial order of 500 point blankets – 100 in 1, 1 1/2, 2, 2 1/2 and 3 point sizes. In 1780, the first HBC point blankets were shipped to Fort Albany on James Bay, where they proved so popular that they became a standard trade item. Before long, several firms were producing this type of blanket for the HBC, North West Company and other fur trade firms. The points were used to determine size and weight without unpacking them. The stripes on the blankets were about 5 1/2 inches (14 cm) long to indicate a full point, and half that long for half a point. Today point blankets are manufactured in sizes up to 6 points, which fit king sized beds. But in the fur trade period the largest blankets were 4 point blankets. 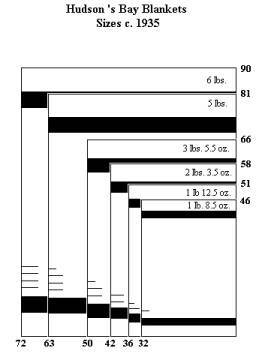 Point numbers refer to the size of the blanket (essentially its width), and thus the approximate cost. A 1 point blanket was originally set at 2 feet 8 inches wide and 8 feet long (although they could vary slightly) and it weighed just over 3 lb. (or roughly 1.5 kg.). Many sources suggest that, for the HBC, a general rule of thumb was that 1 point blankets sold for 1 made beaver (the value of one prime beaver pelt) up to 4 made beaver for a 4 point blanket. This is an oversimplification and the actual cost of a blanket varied from post to post and over time. As well, the points are not always an indication of the quality of the blanket, because blankets of quite different quality – and thus price – could have the same point number (for example, see list from the Columbia Dept below). But eventually, because the Native consumers demanded a particular standard, the trade companies ordered their blankets from a decreasing number of manufacturers, making the size and quality of the point blankets increasingly predictable. Circumstances such as local demand, transportation costs, amount of competition and other factors mean that the actual cost of a blanket at any one time at a post needs to be determined using account books and standards of trade. For example, the prices at Moose Factory in 1784 were 1 made beaver for a 1 point blanket, 2 made beaver for a 1 1/2 point blanket, 2 1/2 made beaver for a 2 point blanket, 3 made beaver for a 2 1/2 point blanket and 4 made beaver for a 3 point blanket. Still the equation of 1 point per1 made beaver is a good rough guide to price. Blankets also came in different qualities, so points should not be taken as an exact indicator of price in all cases.